No one wants to mess with Jorge Ruiz. Even though he is the biggest kid at Berrybrooke Middle School, Jorge doesn’t want to fight. In fact, he uses his size to help protect other kids from bullying. He just wants to play baseball and hang out with his two best friends, Olivia and Garrett. Middle school isn’t so bad for Jorge . . . until he realizes he has massive crush on shy, sweet Jazmine. Suddenly he is unable to speak, or even think, whenever she is around. And when Garrett wants to spend more time with the jerky football boys, and Olivia doesn’t want to be around Garrett anymore, Jorge doesn’t know how he will survive all the drama of middle school. 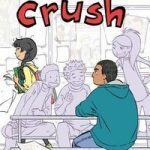 In Crush, we are not given the typical confused and anxious middle school student protagonist. Instead we have Jorge Ruiz, the sweet, gentle, and strong middle school hero everyone wishes they had in junior high. He is a steadfast and loyal friend that always stands up to bullies and protects those that smaller than him from any type of attack. He is just as shy and awkward around his crush as all his other middle school friends, but he is also brave enough to express his feelings and secure enough to admire Jazmine’s strength and intelligence as much as her beauty. The expressive yet gentle pastel colored artwork perfectly captures the joy, pain, and awkwardness of being in junior high. A beautiful yet painfully realistic feeling middle school tale, this book is highly recommended for anyone who has ever felt awkward in school. 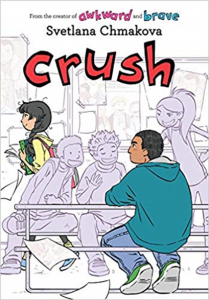 Teens who enjoyed Chmakova’s other Berrybrook graphic novels, and fan’s of Raina Telgemeier’s Drama will especially love this book. In need of temporary housing, Barney is relieved when his friend, Norma, secures him a job as a janitor at Dead End, the least popular tourist attraction in town. It’s not long before Barney discovers that the haunted house is not just a theme park, it’s also a portal to hell. With demons and ghosts moving through hell’s door on the regular, Barney and Norma have their work cut out for them at Dead End. The author of this graphic novel is both the writer and artist, and he has created a story that reads like an animated cartoon (which makes sense as Steele is an English animation director). 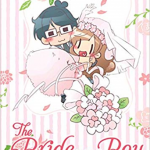 The characters are well-developed and diverse, with relatable background stories; the art is engaging and brightly colored; and the narrative is fun and fast-paced. 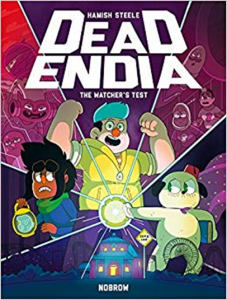 Recommend this graphic novel to fans of Gravity Falls, Scooby-Doo, or the humor and camaraderie of Buffy the Vampire Slayer. 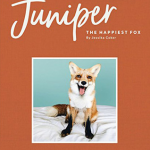 This title is great choice for eager and reluctant readers alike. Attending Samwell University in Massachusetts on scholarship, Georgia-born figure skater, vlogger, and social media junkie, Eric Bittle, joins the men’s ice hockey team and tries to acclimate to college life with all the drama and hijinks one would expect of a queer athlete who problem solves by baking. Check Please! was created as a webcomic and quickly found an eager audience. Presented in episodic chapters, the narrative follows Bitty through his first two years of college, and though there is a focus on the sports aspect, the story is more about the rites of passage in college life and the friendships one makes along the way. The art is expressive, bright, and thoughtful, and the coloring lends to the warm and fuzzy feels that will leave a smile on the face. 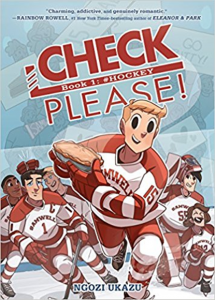 Bitty and his teammates are so well-developed that the reader will certainly be able to relate them as well as to their own irl friends and peers. 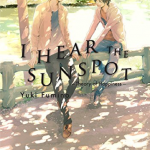 Great artwork and excellent characters make for an amusing and charming coming-of-age story. As there is a certain amount of risqué dialogue and because the story takes place in a college setting, recommend this graphic novel to older teens. Don’t let the sports theme guide you to whom you hand this title. 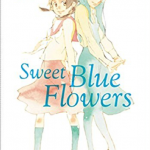 It’s heartfelt and realistic friendships, as well as its sportiness and hilarity, make this a great choice for most teens who are at the cusp of adulthood and eager (and scared) to venture out into post-high school life.